Nothing can top the impact of this Regal Velvet Combo ! 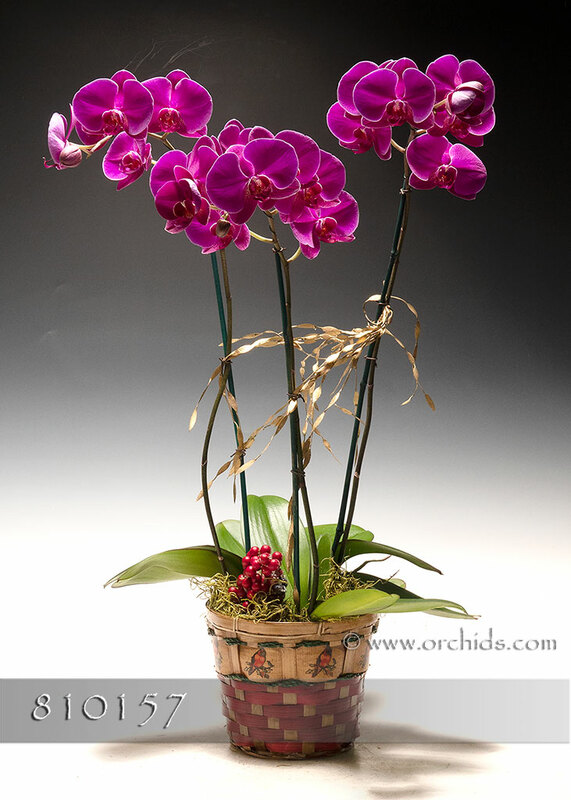 Its rich velvety burgundy flowers draw you in immediately and are reflective of cutting-edge Phalaenopsis breeding today. In perfect harmony to the flowers are their broadened soft pink lips, another special touch from the newest direction in breeding. Our design staff will select the most harmonious plants for this Combo, artistically arrange them in our modern Euro cachepot and enhance the total presentation with faux flowering vines weaving gracefully among the spikes. Standing 25-27” in height, this most regal of Gift Arrangements will be softly finished with a generous bed of jade Spanish moss.